Wittenberg has been fighting an intermittent border war for a few years with Saxe-Jarlsberg, their allies Hesse-Limburger are assembling reinforcements to move up-river. An attack on their camp has been planned - their supplies must be destroyed and as many casulaties inflicted on their troops as possible. Briefing: Your forces are assembling in camp awaiting transport up-river. A large stockpile of supplies has been stored there as well. In the event of an attack it is your duty to ensure that the supplies are not destroyed. It is early in the morning and your troops are dispersed in their tents etc; sentries and look outs are posted. 'Lugger' armed with 4 cannons, plus an assortment of transport boats and barges. Briefing: Your must land your forces and disperse the defenders and destroy the supply stockpile. After destroying the supplies you must re-embark your force and return to base. 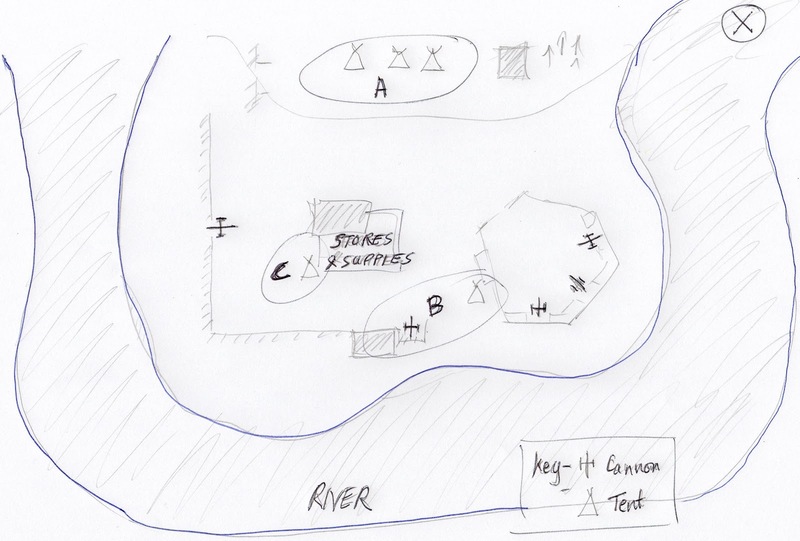 Your flotilla enters at start position X; you may have one third of your force deployed further down the river. Attackers win if they: destroy more than 60% of the stores and inflict more than 25% casualties on the defenders and lose no more than 50% casualties. It takes one full move to set charges, on the next move the effect of blowing the charges can be assessed - damage to supplies is assessed using percentage dice. The engineer's charge goes off and destroys part of the gun battery, the grenadiers move back to their boats; the Hesse-Limburger troops refuse to advance .. The Wittenberg forces successfully re-embark and move back up the river. The Hesse-Limburger camp is in disarray...the bulk of the supplies has been destroyed. The war in the south continues .....Wittenberg decides to strike Saxe-Jarlsberg's ally Hesse-Limburger, the target Konigsweldt - their aim to destroy supply stockpiles and do as much damge as possible to troops assembling to move up river. A small vignette to add to a camp scene - two muleteers having a chat while their mules are having a nibble and a snooze. Muleteers are Creartec castings with Sash&Sabre heads, the mules are a resin casting and an old toy. Front Rank prussian hussars painted with auniform in the style of the Saxon Frei-Husaren von Schill.